Hey guys! My next couple of posts are going to be about some of my favorite accessories: JEWELRY! Most of you should know by now how much I adore things that are cute, sparkly, shimmery, iridescent, reflective, etcetera etcetera and there is nothing better in my humble opinion than crystals. They just come in such a wide variety of colors, shapes, sizes... Endless possibilities! Having done a bit of jewelry making myself in the past, I have so much respect for the blogger girls who are making their own business by custom creating these lovely items to sell online. One of these super sweet ladies is Lisa from He Qi Crystal Designs (formerly known as HeHe Productions) who has been doing craftmaking for a number of years. You Soompi girls probably recognize her as one of the biggest sellers in the selling & trading forums, and she definitely lives up to her experience. 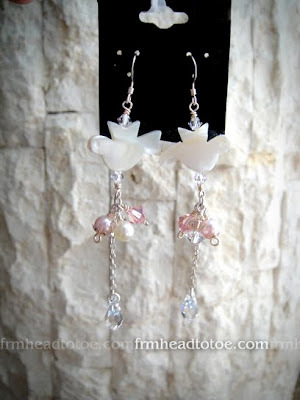 Browsing through her online store http://heheproductions.ecrater.com it was very difficult to choose what I wanted to get (I wanted them all XD), but these really adorable mother-of-pearl earrings really caught my eye. Here is what the earrings look like on. Really nice size, isn't it? I really like how the crystal at the bottom hangs. It's very delicate but still shows up a lot. Silly, silly. Love my new earrings! They just frame the face so well, don't you think? Nicely proportioned! are you wearing false lashes in the pics with the earrins? or really good mascara? reccomendations? And the makeup suits it so well... So you just used two colors for the eye makeup? i wish you would just embrace how your eyes are naturally and be yourself. unless you are planning to get double eyelid surgery, you are just stretching your eyelids out with that tape. trust me, i know from personal experience. you are doing irreversable damage to your eyelids!!! Thanks again! May I save your modeled pix? Daituf: I used those two colors, and also a whitish shadow to highlight inner corners and brow bone. Thank you so much! Lisa: You can absolutely take these! And I JUST got your little surprise in the mail today! So cute and delicate. I'll definitely wear them soon! Too bad it was too dark when I got home to take pics. :P I love the little heart hooks though. ^^ Thank you!!!! Jen, you are absolutely stunnning! oOo, which lenses are you wearing btw? they look great on you!! 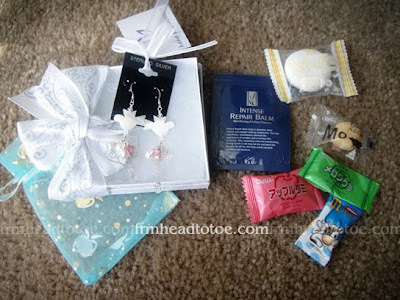 i sometimes browse thru lisa's soompi shop and i saw earrings similar to the ones you have! 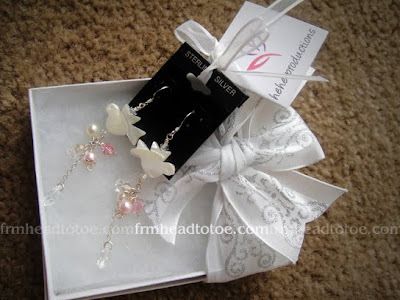 the ones with doves =D omigosh, i doves <3 they look great on you by the way! i'd buy earrings from her too, but unfortunately i don't have my ears pierced..and i'm 18 lol. i'm planning to get them pierced in the near future tho. hopefully perfessionally and not with a gun! I never really cared much for lenses until I came across your blog and saw you in Solotica Hydrocharmes and the EOS Adult Greys. They look so good! Hi, just wondering if those pics were taken by the pink sony cam you have. I have the same one but the pic quality is not like that : ( any secret? Anonymous: I am wearing EOS brand Adult Grey lenses. Thank you so much! Aggie: Yes, I did use the Sony Cybershot T-90 for this. Tips for getting good pics... First of all, good lighting. Natural light is the best imo and the "auto" focus usually works very well but sometimes I use the "soft snap" option. Try to hold your hand very still when you take a photo, or prop your hand against something to keep it still. Hope that helps! i love he qi's designs too (from soompi), they're amaazingg. the lenses are gorgeous! Lovely pair of earrings! Love the dove shape! Hey Jen, check out some of these cool earrings, they are different for each sides, something really unique! very cute :D i was eyeing those too!